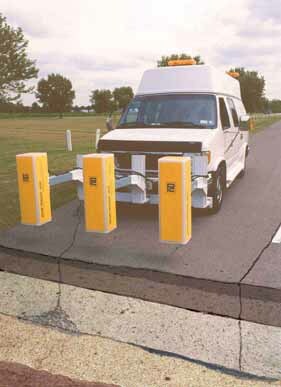 Central Missouri motorists might see a tricked-out van similar to this driving on and around bridges. It belongs to a company called Penetradar. They use ground-penetrating radar to evaluate pavement - as in this image from their website. It's also great for analyzing bridge decks. Think of it as a giant CAT scan or MRI. Back in the day, doctors often operated with minimal information - maybe an X-ray and a list of symptoms. Surgery was measured in hours and recovery in weeks. Now before surgery, doctors and technicians gather information so they know what they'll face in the operating room. Some surgeries are down to minutes and often patients go home the same day. MoDOT is planning to start some bridge work in the Columbia area soon, so the van is gathering data. That information will help identify issues within the bridge that need addressing before a single cut is made in the pavement. That helps the repair contractor. They'll know what they are facing before they open the surface. Fewer surprises make for less stressful, more profitable work. It helps MoDOT. Fewer surprises make for fewer last-minute (often expensive) fixes and keep work zone time to a minimum. But most of all, it helps motorists. When a contractor knows what they'll face, they can "operate" and get out of drivers' way more quickly.